Meet Garima Goyal, who had to give up her dreams because of an irreversible and degenerating eye condition, went on to become one of India’s first visually challenged media graduates. For a regular 15-year-old, this might have sounded like bickering about the mess in the room, her grades or some such mundane problem. Garima’s brother, Ashish, however was no regular teenager. After that morning, she wouldn’t remain one either. It had been a few years since her brother was diagnosed with Retinitis Pigmentosa, an irreversible and degenerating eye condition. Ashish Goyal was going blind. And now, so was Garima. A little over 10 years since the day, the two siblings have lost most of their vision. Ashish has gone on to become the first blind person to graduate from Wharton and is the first blind trader at J P Morgan’s London operations. Garima is one of the first visually challenged media graduates from the Maharashtra State Board of Technical Education. She’s completed her course in social communications media from Sophia College — a major portion of this course involves a strong visual element. She has around 20 per cent of her sight remaining.To be honest, at first, she didn’t seem like a visually challenged person to me either. Part of it, perhaps, has to do with the fact that Garima is so comfortable with her impediment, she’s learnt to overcome it superbly. It was a senior in college who sensed this and offered to help. Garima counts her years in college as being some of the toughest. Coping with her condition during her teenage years was not easy. She remembers jumping into extracurricular activities just to keep depression away. At the time, Garima’s condition was in its nascent stages. She could still go about her daily routine without anyone noticing the difference. But, since it would only be a matter of years, she decided to let her friends know. When I asked her about the most difficult times in her life, she counted this as the first. It took her three years to come out of that phase. “I used to sit for hours doing nothing. Time and the fact that no one let me give up healed it, I suppose,” she says. 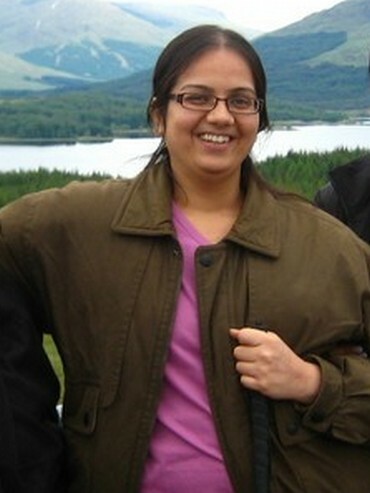 The second phase was when she was pursuing her Master’s course in Commerce from Sydneham College, Mumbai. Around this time, Garima found solace in writing — she has two unfinished novels and a whole lot of poems — and asked herself what she hoped to do in the future. “Media seemed to be the place where creativity and writing came together,” she says. Garima joined Hindustan Times in Mumbai as an intern to get first-hand experience. She remembers her first day — a friend came over early in the morning and helped her go through six newspapers. For the next three months, Garima worked at their office, where she edited stories for the Metro desk with the help of special software they had let her load. This was the first brush she had with the outside world. It gave her the confidence to step out of her comfort zone; it also gave her much-needed direction. Three months later, Garima knew what she wanted to do. She applied for the social communications media course at Sophia College, Mumbai. “The department had inhibitions as to how a visually challenged would pursue a high-pressure visual course. They communicated their reservations to me. Garima started off on what she describes as the third most difficult phase in her life. Garima’s first assignment involved watching D W Griffith’s The Birth Of A Nation. By now, Garima had lost most of her eyesight. But she hadn’t stopped going to the movies with her family and friends; she could still follow most of what was going on because of the dialogues and the music. The Birth Of A Nation however was a different ball game altogether. Released in 1915, the seminal movie belongs to the silent era. By the time she went back home though, Garima had made up her mind to get around the situation. She searched online for information about the movie, read up on it, researched the hell out of the topic and came back to the next class. In her semester exam, she would top the film paper. Garima says the course made her push her limits. It was challenging and affected her health but, she says, it was worth the effort. Along the way, Garima made friends — friends who stuck by her, didn’t mind being woken up in the middle of the night to talk to her or stop by just so they could do little things for her. Looking back at her achievements, Garima is content. She is currently working with her guru, Balaji Tambe, who runs a holistic healing centre in Karla near Pune and is translating his works into English. She has never learnt Braille and says technology has helped her get by without much difficulty. Her phone and laptop have screen reading software that help her read and write. Life may not have dealt Garima a fair chance, but it isn’t something she is complaining about; she prefers to focus on her future. The one lesson she’s learnt though is to be true to herself at all times. This entry was posted in Uncategorized and tagged Ashish Goyal, Garima Goyal, Hindustan Times, India's first visually challenged media graduates, Sydneham College. Bookmark the permalink. Exceptional minds do things differently. Awesome!